How to install SMS Alert for prestashop. Prestashop is a professional shopping cart management system. It helps in creating coupons, Vouchers, custom discount codes and many more things. Prestashop is one of the most preferred choice of the online store owners, it is very important for every online store to keep it’s customer informed about their new Products, ongoing sale, coupon vouchers and so on, these things will help them in flourishing their online business to more and more people. 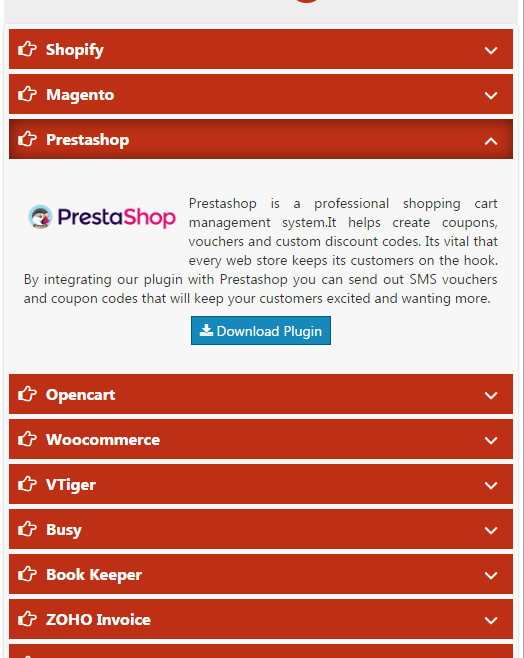 By integrating SMS plugin with Prestashop you can send out SMS vouchers and coupon codes, that will keep your customers excited and they will look for more. First you have to download SMS Alert plugin for the prestashop from your sms alert panel. After downloading SMS Alert Plugin, you need to Login in to your admin panel of prestashop and go to modules and select the module. go to the folder where you have downloaded the zip file and select it and click on open. Now go to modules and search for SMS Alert and install it. When the installation is done window will automatically redirect you to configuration part. By default all the sms are deactivated to activate the sms check the active checkbox to activate and click to save.